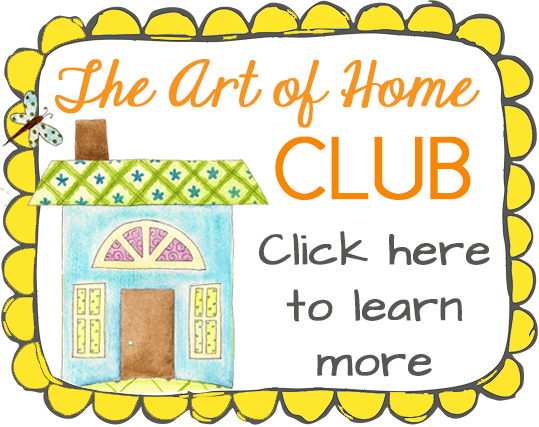 Are you ready for a cute little no-sew project? Embroidery hoop art is HOT right now! I love using Heat n Bond lightweight fusible web for craft projects! 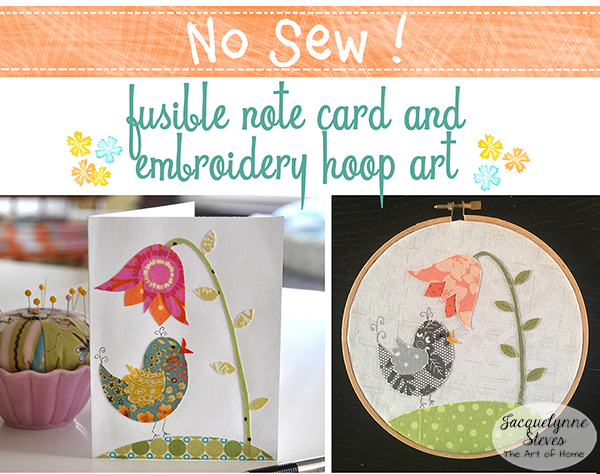 It’s much less messy than glue, and as you’ll see with the note card, it’s a great way to combine fabric and paper in a project. 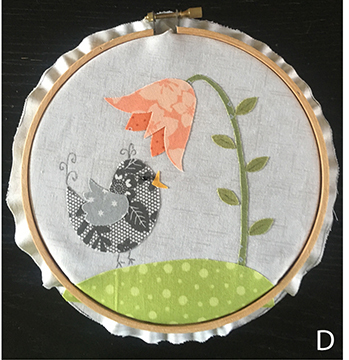 We’ll be using the same design to make a bird note card and bird embroidery hoop art. You can add embellishments if you want- try adding a ribbon bow at the top, or you can use your sewing machine to stitch around the edges of the pieces. Another tip- If you’re nervous about using a permanent marker to add details, use a Frixion pen instead! If you don’t like how it comes out, just iron out the mark and start again! Since these projects won’t be washed, it’s not a problem. 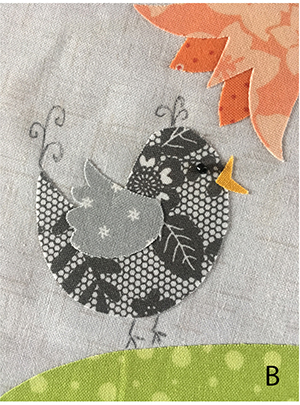 Another option is to hand embroider the bird details. For either project- Trace the pattern pieces onto the paper side of fusible web. Cut out shapes, leaving about 1/8” around each shape. Set iron to medium-high, no steam. 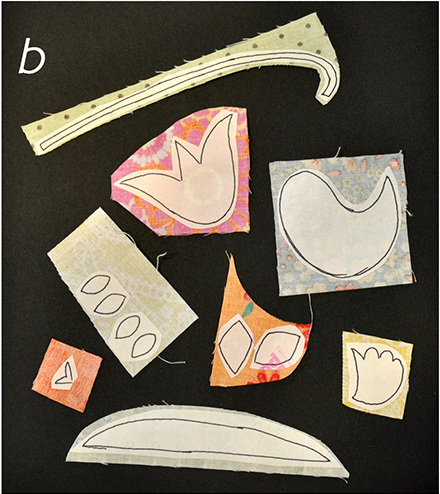 Iron shapes to WRONG side of fabric or paper scraps. See photo b. Cut out shapes on line. Remove paper backing. 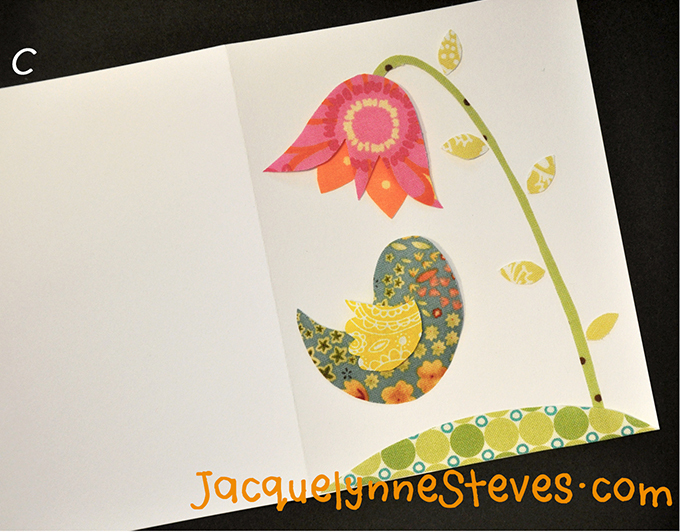 For note card- Cut card stock in half horizontally, then fold in half to make a card which is 4 1/4” x 5 1/2”. Place note card on ironing board. 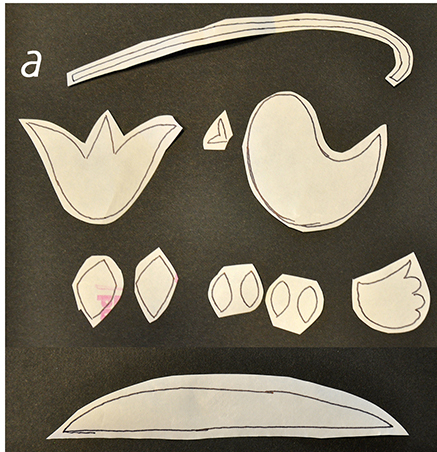 Arrange shapes (except for beak) on the note card, noting that some shapes overlap each other (note the dotted lines on the pattern.) Use tweezers if necessary. Now it’s time to fuse the shapes to the card. This is very important- hold the iron several inches above the card. Press the iron to the card in one straight, downward movement- you don’t want to slide the iron as this will cause the shapes to shift. Hold the iron for just a second or two. Lift the iron and repeat, until all of the shapes are fused to the card. Once the shapes are fused, you can go over the card lightly with the iron to make sure that you’ve gotten all the edges. See photo c.
Immediately place the card under the pile of heavy books (while paper is still warm.) Allow to cool. Add the beak, using tweezers if necessary. Fuse as described above. Use fine marker to add details like legs, eye, and feathers. You can also glue on a small bead for the eye if desired. 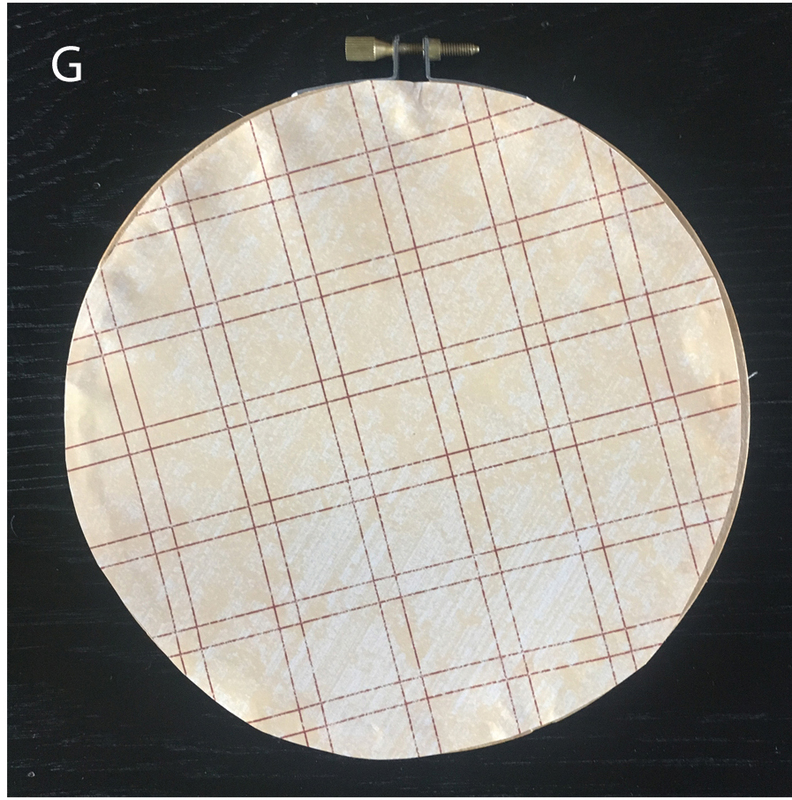 For embroidery hoop- Trace circle pattern onto fabric square and cut out. Arrange applique pieces in center. Place the embroidery hoop over the top to make sure that all of the pieces are included inside the hoop. See photo A. Remove hoop. Carefully use iron to fuse shapes to fabric. If desired, you can machine applique the edges with a blanket stitch or zig zag stitch, but it’s not necessary. Add details with a fine point marker, or you can embroider them. Add bead for eye if desired. See photo B. Trace the large ring of the hoop onto the wrong side of the scrapbook paper or cardstock. Cut right inside the line, so that the circle is just a little smaller than the outer edge of the large ring. Set aside. Place small ring of hoop on table. Center the bird design right side up on top of the ring. See photo C. Place large ring on top and tighten screw, making sure that fabric is smooth. 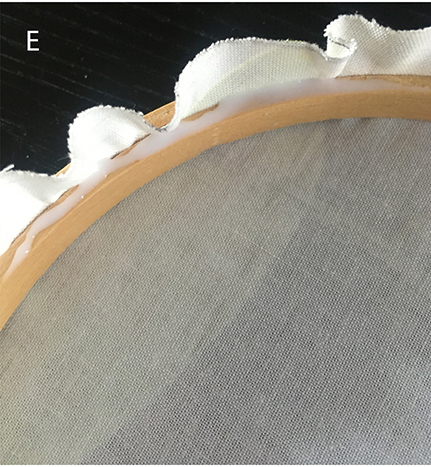 See photo D.
Place a small line of glue on the back of the embroidery hoop and glue down the fabric edge. 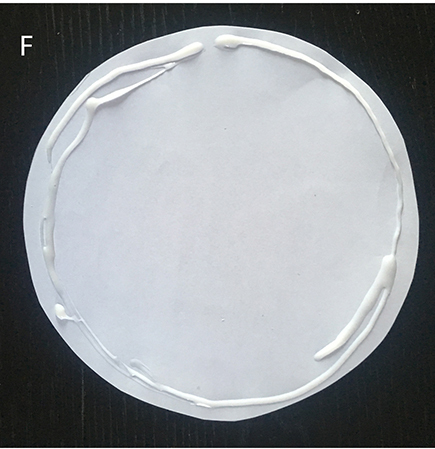 See photo E. Place a line of glue around the edge of the wrong side of the paper circle. See photo F. Place on the back of the embroidery hoop art. 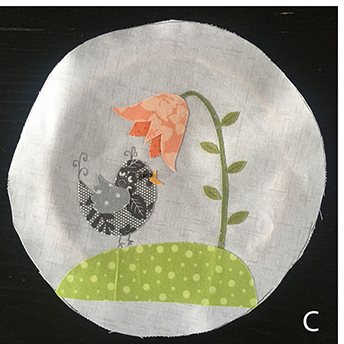 See photo G.
Click here for PDF of instructions and bird pattern. This article was posted in Crafts & DIY, Featured, Tutorials. Bookmark the permalink. Follow comments with the RSS feed for this post.Post a Comment or leave a trackback: Trackback URL. What a neat idea. I will have to try these. Thank You for the idea. 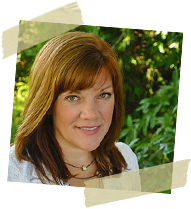 Thank you Jacqulynne! That is so cute. Thank you. This is just so cute. Thanks so much for sharing this and the Save the Bees Quilt, which is close to my heart since I had raised bees at one time and it’s sad to see what is going on right now. 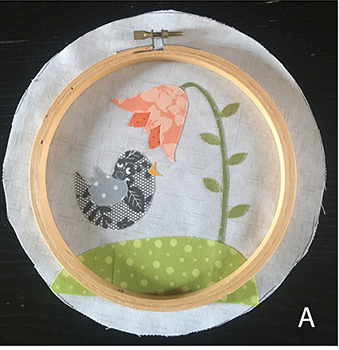 Love the bird card and hoop project — looking forward to making this precious pattern. Your generous sharing is truly appreciated. That looks like a fun project. Sew cute. I hope to try it sometime. Thank you so much Jacquelynn for sharing.